To celebrate the 90th anniversary of the Museum’s first Chinese exhibition in 1923, the Newark Museum will feature over 175 treasures of Chinese art acquired over the past century, many never before displayed to the public. During the Qing Dynasty (1644-1911), Chinese emperors competed with their forbearers by commissioning new works of art that imitated, honored or improved upon earlier imperial commissions. In China these art objects always included “everyday” items. Tables and chairs were transformed into spectacular sculptures through the addition of gilding, lacquering and mother-of-pearl and colorful cloisonné glass insets. More than simple clothing, splendid silks covered with artful embroideries transformed in phenomenal artistic statements. Birds, cats and butterflies one sees out the window were painted on hanging scrolls, becoming monuments embedded with social commentary—the meta-data of centuries past. Ceramics and enamel wares appeared as jewels on collector’s shelves—both in the Ming (1368-1644) and Qing (1644-1911) periods and certainly today. 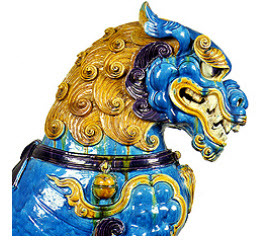 Some of the Newark Museum’s imperial works are the other halves of pairs to holdings in the Palace Museum, Beijing, and the National Palace Museum, Taipei. In addition to these Chinese treasures, a section of the exhibition will showcase historic and contemporary ceramics made in the West that were inspired by Chinese examples. Need a New Hobby? Be a Rainfall Reader!